Animal Wildlife | Golden Poison Frog | The Golden Poison Frog is the most poisonous animal in the world.Unfortunately,they are on the brink of extinction because tropical rainforests are disappearing.The golden poison Frog's skin is densely coated in alkaloid poison,one of a number of poisons common to dart frogs which prevents nerves from transmitting impulses,leaving the muscles in an inactive state of contraction.This can lead to heart failure or fibrillation. 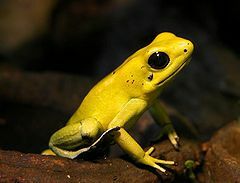 The Golden Poison Frog's natural enemy is a genus of snakes called the Leimadophis Epinephelus. These snakes are unaffected by the lethal poison of the Golden Poison Frog. 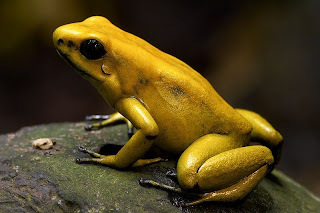 The Golden Frog lives on the ground in humid forests, and is only known from primary forest. It is not known whether or not it can adapt to secondary habitats. The eggs are laid on the ground and the males transport the larvae to permanent pools. 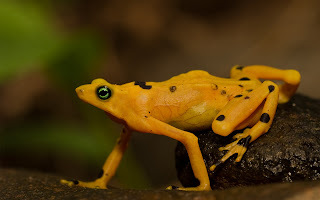 The main natural sources of food of Golden Poison Frogs are the ants in the genera Brachymyrmex and Paratrechina, but many kinds of insects and other small invertebrates can be devoured, specifically termites and beetles, which can easily be found on the rainforest floor. This frog is considered the most voracious of the dendrobatids. 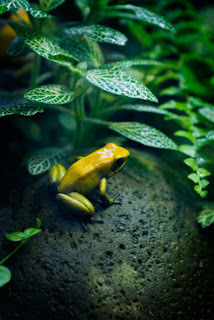 In captivity, the frog is fed with Drosophila fruit flies, cochineals and crickets, the larvae of various insects, and other small live invertebrate foods. An adult frog can eat food items much larger in relation to its size than most other dendrobatids. Golden Poison Frog is a very important frog to the local indigenous cultures, such as the Choco Emberá people in Colombia's rainforest. The frog is the main source of the poison in the darts used by the natives to hunt their food. The Emberá people carefully expose the frog to the heat of a fire, and the frog exudes small amounts of poisonous fluid. The tips of arrows and darts are soaked in the fluid, and keep their deadly effect for over two years. In many ways, humans have benefited from the Golden Poison Frog. Yet today, the wild frogs are in danger of extinction. They live in only certain parts of tropical rainforests that are disappearing as deforestation and farm land development continues in various parts of the world. 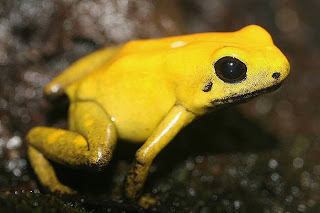 0 Response to "Golden Poison Frog"